Discussion in 'Systems and Methods' started by jack, Jul 2, 2013. What I'm about to discus is something I've seen a lot with traders who are just past the "establishing consistency" stage and entering the "scaling up" stage of their training/career: Despite nothing else changing in the market around them, they struggle when dealing with increasing the order size of their trades as the increased size can push them just slightly out of their comfort zone. In turn, these struggling traders start making poor trading and execution decisions and next thing they know they are scaling back down to the size they came from due to a string of losers. Quite often, this hurdle can plague a trader's development, even for months, until they crush out their negative emotional response to the increased risk and push forward without being phased by the change in risk. Later on, I met another manager who took to a different method: A concept that not only made more sense as a step in between building consistency and risk scaling, but became a skill I think everyone should learn regardless of how far along they are developed as a traders. "Being more aggressive doesn't just mean taking on more shares." -- This is what the 2nd manager told me one day after I hit my risk limit trying to scale up in a stock a little too quickly. I got thick in a position without giving the market enough room to move and our risk software flattened me out (at a loss) long before the trade itself was even considered bad. I had messed up, and while it was not a very costly mistake by my standards today, back then it soured my day for sure. I asked my manager what he meant by the 'more aggressive' line, since I understood what he said at its face value but didn't quite how to apply it. He then pulled up his records for the day for the stock we were targeting, and read off the numbers. Most of our directional trades were the same (as we were executing a strategy the firm employs often) but he had taken 140+ executions that day vs my ~30. It instantly hit me.. we were trading the same signal, but he was able to milk more profit on a per signal basis than I could have hoped to do even if my high size trades worked out. All he was doing was being more aggressive in taking the risk off and putting it back on, and in the process he lowered his overall risk while banking profit along the way. If you're expecting a given amount of profit for your trade, and it's reasonable to assume price doesn't move in a straight line directly to your target, then it's possible to scale up your return without increasing your size (risk) by working in and out of exposure as the market shimmies toward your target. The "big boys" who manage multiple millions have to do this, they have no choice, as they can't just execute their huge positions all at once without impacting the market (and giving them unfavourable fills.) So they learn to do this out of necessity, scaling into and out of position as the market works for, or against them. All we're doing is picking up the skill early on and applying it in a way that can help us improve our trading results well before it becomes a necessity due to increased size. To get technical: At no point does this active and aggressive method of trade management increase the risk of a trade. It can only serve to reduce risk on winning trades or lock-in some profit before the trade turns bad anyway. The main goal is to take off exposure at points you've identified as possible levels your trade might turn against you, and putting that same exposure back on at possible price levels that look like they could hold against the market and keep your trade in the green. Around point 1 we get a buy signal (in this case, price moved above some arbitrary MA.. I donno, eleventy-four period liner weighted with sprinkles ) and your system tells you to buy holding out for a take profit near a major resistance level on some higher timeframe. 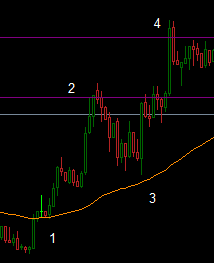 You've identified the higher timeframe's resistance as the upper purple line near point 4. You've also identified some near term resistance on the lower purple line near point 2. As price moves in your favour, you come up against the near term resistance. At point 2, you take a portion of your trade off the table. At this time you probably already moved your stop to break even. Price falls from this near term resistance and approaches your arbitrary MA line but seems to be finding some support (noticed near point 3 that price is struggling to move down, keeps finding buyers, and generally isn't moving very cleanly against you.) So here you decide to put the exposure back on and increase your position to what the trade started at. You've moved your BE stop to a higher level to account for the new exposure. Price breaks through near term resistance and hits your target at point 4. Working the trade like this netted you more overall return on the trade than if you had passively managed the trade and signal. No additional risk was involved either. Price moves instantly against you (darn, and here you thought price crossing an MA line twas 'teh' holy grailz! ) stopping you out. You'd lose just as much as you would have passively managing the trade with a plan to be aggressive since you had no chance to really take anything off the table in profit. Price moves to point 2 and then sharply down to your stop out level. In this case, you would have set your stop at BE, but you wouldn't have made a dime with the passive 'holding' method while the aggressive method would still have walked away with a few pips/ticks in your pocket. Price rockets straight to point 4. You lose out on some profit having taken some exposure off at point 2, so the passive method would have worked out better for you here. However, trading is about probabilities and probabilisticly-speaking it's unlikely for this outcome to happen frequently (especially if your target is 100+ pips away.) Of course this also depends on your strategy and the distance between your entry and target... so you will have to judge the likelihood of price rocketing to your target as it relates to your trade plan.. Go back over your trade records and crunch the numbers. You can always scale your position sizes higher to increase profits (and risk) when that time comes, or when you simply can't expect to actively manage the trade any more aggressively... but as a step in between becoming consistent and increasing trade size it's a skill I think fits in perfectly.